A fixed term annuity is also known as a fixed term plan and is written under drawdown rules so you can retain your fund at the end of the term. 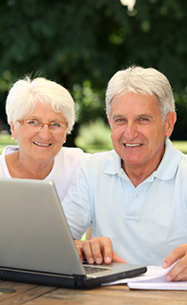 It is available for anyone over the aged 55 and allows you to take income and keep control of your fund. In contrast, a lifetime annuity provides an income in exchange for your fund and you cannot change this even if your circumstances change in the future. A fixed term annuity lets you take your 25% tax free lump sum and the remainder of the fund sits in a tax efficient pension plan where you can receive a guaranteed fund at the end of the term. It can be accessed if you are a UK resident, a resident of another country including the United States as long as you have a UK bank account. It is possible to take the full fund over a specific period of time and deplete the fund which could be useful to reduce the amount of tax by spreading the income over a number of tax years. You can receive a guaranteed maturity value at the end of the term with all your options available at that time such as buying another fixed term annuity, a lifetime annuity or flexi-access drawdown from any provider. The underlying assets are invested in gilts and corporate bonds offering a guaranteed return to the end of the term. There is no investment risk and the return improves with longer terms of 5 to 10 years which are generally between 2.0% to 2.5% per year. The future is uncertain so if you started working part time, sold a property, cash-in an investment or received an inheritance and did not require the income at that time, the income from the fixed term plan can remain in the cash account. If you decided to set-up the fixed term plan on a £Nil income basis, it may be more useful to take an income and place this in the cash account to give you the flexibility to access funds during the fixed term if needed. 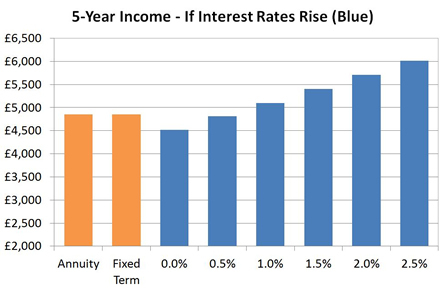 Annuity rates are based on 15-year gilt yields which increase with rising interest rates. Rising 1.5% yields would be about 150 basis points higher and annuities would improve by 15.0%. The following chart shows how annuity rates have reduced and closely followed gilt yields since the financial crisis. 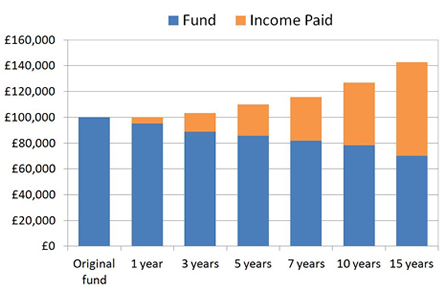 Source: Sharingpensions.co.uk research based on annuity rates and gilt yields in July 2008 and the changes over time and recent improvements. A five year fixed term annuity can provide any level of income, however, if you select an income of £4,850 pa you will receive a guaranteed maturity value of £86,210 at the end of the term. With interest rates rising by 1.5% from current levels, annuities could increase by 15% providing a lifetime annuity of £5,401 pa. The income from a lifetime annuity on a 100% joint life, monthly advance and level basis is £3,640 pa. The fixed term plan can also match this amount with a guaranteed maturity value at the end of the of terms in the example from one to fifteen years. The longer the time period the better is the return. Source: Sharingpensions.co.uk research for a 60 year old with a fund of £100,000 on a single life with 100% value protection and monthly in advance. Combination of GMV at the end of the term and income of £3,640 pa paid over different terms. The fixed term you select should be the ideal time you would like to consider your options again. However, circumstances can change and if you do need to buy a lifetime annuity earlier, such as due to poor health you can exit the plan at this time without penalty. The fund you receive will be based on your age, the income you have received up to that point and the value of the underlying assets used to provide the guaranteed maturity value at the end of the term. The change in the value of gilts, corporate bonds and other assets would determine if it was in your interest to exit at that time. By adding a 100% joint life benefit the income will continue to your spouse for the term selected and at the end of the term the guaranteed maturity value will be available. If you wanted the income from the plan to continue for a fixed period of time, such as the full term of the plan, add a guaranteed period. Income would be paid to your nominated beneficiary or your estate although at the end of the term there would be no guaranteed maturity value. Suitable if your fund is £20,000 or more after tax free cash for terms of 1 year or more.